Phillip is an internationally recognised political thinker and social and economic commentator. He bridges the gap between politics and practice, offering strategic consultation and policy formation to governments, businesses and organisations across the world. 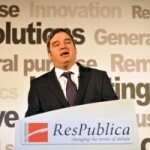 He founded ResPublica in 2009 and is an academic, journalist and author. Prior to entering politics and public policy he was a senior lecturer in theology and philosophy – teaching at the Universities of Exeter and Cumbria. He is the author of Red Tory (Faber and Faber 2010) which sought to redefine the centre ground of British politics around the ideas of civil association, mutual ownership and social enterprise. His ideas have influenced the agenda around the Big Society and civil renewal and have helped redefine British and international politics. Papers he has authored and co-authored while at ResPublicainclude Military Academies: Tackling disadvantages, improving ethos and changing outcome (2012), Asset Building for Children (2010) To Buy, To Bid, To Build: Community Rights for an Asset Owning Democracy (2010)and The Ownership State (2009). Phillip has written extensively in the British and foreign press including The Guardian, The Independent, The Observer, The Financial Times, Prospect, New Statement and The International Herald Tribune. As a renowned speaker and communicator, Phillip is a frequent broadcaster – appearing on theBBC and Sky News as well as foreign media. Through both his writing and speaking Phillip argues for a new economic and social politics based around free association and group formation.